20% deposits of the total amount. Conveniently located on Ratchadamri Road, Bed At Town is towards the shopping area in the heart of Bangkok. From here guests can enjoy easy access to all that the lively city has to offer. It is within walking distance to nightlife, restaurants and other attractions. Bed At Town is designed at mind for travellers. Each bed offers spacious and considerate design with the intelligent comforts. This trendy lifestyle hostel provides high speed internet all over the hostel, 24 hour reception and the highest safety standards. Each floor has cleaness bathrooms and shower facilities for sharing, as well as features the rest area, which have television in the common area. There is a laundry room at the first floor, and coffee shop serving you from 8am to 6pm. Every moment you are with us, you are guaranteed to have a comfortable living and good night sleep. (1) Cash payment is preferred upon check in at the hostel. (2) Credit card payment is acceptable. This place was great, everything was perfect! breakfast was good and filling, wifi was extremely fast and reliable, facilities are brand new and very clean, staff was very nice and the location was great. The only thing is that the hostel does not have much of a backpacker vibe (which is up to you to say if that's good or bad. I enjoyed the peace since I had just arrived in Bangkok. So I would not necessarily rely on the hostel to meet people. (Maybe it was just my timing) I'd stay again! 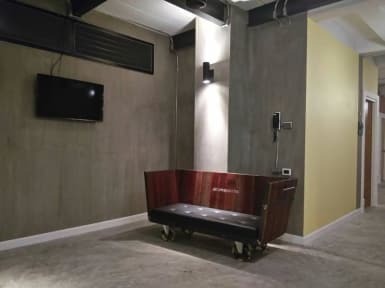 I'd stayed in many hostels in Bangkok and this is one of the best. It's in a central location, clean facilities, friendly staff, comfortable beds, Free bedfast and wifi. I would gladly book again on my next visit. I had a private room - clean, safe, good location. I just needed a place to sleep and shower and it did the job. Hot water, workin a/c, locked cupboard for my belongings. Bed service and decent linens. A great stay. I'll be back again for sure. This place didn't really have a backpacker vibe when I went. It seemed more for local families. Perfect location in the center of everything. 3 mins walk to Big C, Neon night market, River boat station, Main shopping centres. The only bad thing that I could think of is facilities. They don’t offer drinking water or basic amenties like cotton balls or cotton buds. The curtain next to bed doesn’t cover whole bed at the lower deck. If you like privacy, stay in upper deck. I stayed in this place few times already. 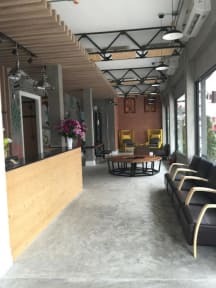 Good location if interested in the BKK shopping area. I stayed in this hostel twice and sorry to say but the 2nd time was bad. We booked online a room for 4 people and when arrived were told that it is really busy and they put us in a 6-bed room with 2 strangers, no bathroom. No towels were available and duvet had no covers. The check out was a bad too as I waited for about 1 hour to be told that I will not get my deposit of 500 Baht back as it was already returned to me by mistake (word agains word, no evidence, so we left without a deposit).